Nat Harry prepares a Shirley Temple at Revival Bar + Kitchen. Dave Smith, distiller and blender at St. George Spirits, evaluates his work in the laboratory. In the Bay Area, we are surrounded by an abundance of farms that grow high-quality produce and chefs who embrace the use of diverse seasonal ingredients. It’s easy to understand how bartenders, who frequently work alongside these chefs, are often inspired to showcase the same fresh produce. 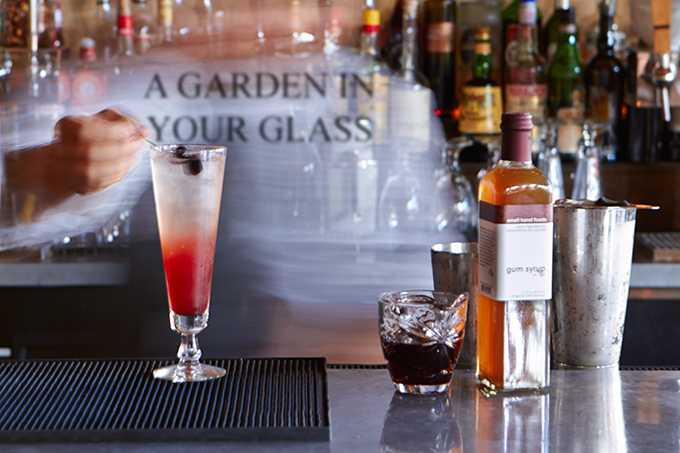 In the past few decades, a growing number of innovative Bay Area bartenders, along with distillers and other beverage producers, have been instrumental in growing a trend known as “garden to glass,” which has taken hold all over the continent, if not the world. Garden to glass, like farm to table, considers all stages of food production and favors the use of locally sourced ingredients. Alice Waters cites taste as the driving force behind her initial decision to use local and seasonal produce when she was creating the first menus at Chez Panisse forty years ago. What began as a way to find the best quality became a form of environmental consciousness and took root in places around the United States in the 1990s. At a number of notable Bay Area restaurants, including The French Laundry, Zuni Café, Larkspur Landing, Martini House, La Toque, and Cyrus, chefs following Waters’ lead carried that philosophy from the kitchen all the way to the barroom. Local sourcing became a foundational principle for Jörg Rupf, a native of Germany, when he opened St. George Spirits distillery at Alameda’s decommissioned Naval Air Station in 1982. Rupf was so awed by the raw ingredients he found growing in the Bay Area that he felt compelled to use local fruits as the base for his eaux de vie. The local sourcing tradition continues today at his distillery. Winters, who is equally driven by the agricultural richness of the Bay Area, has been instrumental in building the product line. Botanicals growing around Mt. Tamalpais were the inspiration behind the distillery’s Terroir Gin, which calls on the same plants to create the smell and sense of place. Many ingredients are foraged from the wild: “We go up to a ranch just outside of Anderson Valley to get our Douglas fir. . . . I wander down the street I live on to get bay laurel,” says Winters. 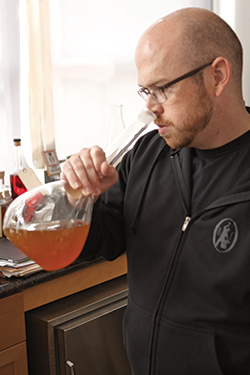 Thad Vogler, owner of Bar Agricole and Trou Normand, was one of the first in the cocktail industry to begin to think of spirits as a type of food. He treats spirits as agricultural products and considers how each is produced when choosing what to carry at his bars. When he headed the beverage program at the Slanted Door in 2004 he chose Hangar One Vodka—formerly made by St. George Spirits—for Cosmopolitans and their Buddha’s hand infused vodka for Lemondrops because they were made locally and used food, rather than chemical additives, as flavoring. Around the same time, bartender Scott Beattie was working alongside Chef Todd Humphries’ at Martini House in St. Helena. Inspired by the chef’s interest in foraged produce, Beattie began dabbling with ingredients he found in his father’s garden. Like Vogler, Beattie favored locally distilled spirits from St. George and from Charbay, a St. Helena-based producer. In 2005 he became the first bar manager at the famed—but now defunct—Cyrus Restaurant in Healdsburg, Beattie observed that guests were generally complacent about cocktails. Looking to elevate his program to match the restaurant’s food, wine, and service, he began creating visually engaging drinks using farmers’ market ingredients. The kitchen staff opened their space to him so he could expand his experiments with foams and dehydrated fruits. After reading Chef Daniel Patterson’s 2004 opus, Aroma: The Magic of Essential Oils in Foods and Fragrance, Beattie met with Patterson over coffee to discuss essential oils and hydrosols—things that had not yet been used in cocktails. He read Karen Page and Andrew Dornenburg’s The Flavor Bible, and often dined out to experience flavor combinations he found compelling and might be interested in trying in drinks. Cyrus chefs Douglas Keane and Drew Glassell shared their pickling recipes with him and together they discussed their respective menus. “I was borrowing ideas and techniques from chefs and using Alice Waters’ philosophy,” Beattie says. He read Michael Pollan’s The Omnivore’s Dilemma. “That book was very influential and made me think about where food comes from and how it got to the table. It helped me to put a face on ingredients. There’s deliciousness to be had if you put some thought into it,” he says. Beattie’s efforts—which were presented in colorful and ornate drinks—were well and widely received. With his own book, Artisanal Cocktails: Drinks Inspired by the Seasons from the Bar at Cyrus (published by Ten Speed Press in 2008), Beattie motivated dozens of bartenders to explore flavors from their own backyards. 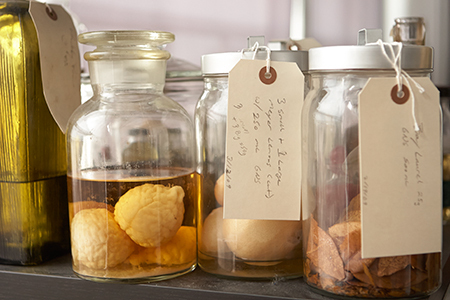 Agricultural products and foraged items line the shelves of the lab at the St. George Spirits. Meet Jennifer Colliau, the talent behind Small Hand Foods and also the founding manager of The Interval at Long Now, a bar, café, and social space, which opened in May 2014 at Fort Mason in San Francisco. Colliau worked for Vogler at the Slanted Door and remembers when Scott Beattie began to earn recognition for his innovations. Around that time, Eric Adkins, a Slanted Door manager, encouraged Colliau to create an orgeat for the restaurant’s Mai Tai. She went through many iterations of the almond syrup before coming up with a successful recipe, which soon earned her a strong reputation among the area’s bar community. It also served as the impetus for the launch, in 2008, of Small Hand Foods. 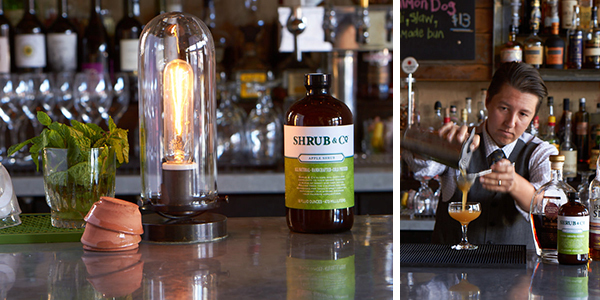 Based in Berkeley, Colliau’s company produces a line of pre-Prohibition-era syrups and a tonic. Among the first products Colliau created was a version of grenadine: Historically, this popular bar syrup was made from pomegranate juice, but large commercial producers might make it from currants and high-fructose corn syrup. While developing her grenadine, Colliau emulated Alice Waters and tried every variety of pomegranate she could find at her local farmers’ market, cooking the juice into syrup and learning all she could about the fruit’s natural earthy, jammy flavor. With her grenadine on the market, Colliau quickly ran into one of the greatest challenges a successful small business owner has to meet—filling the demand. During her first two years, she made her grenadine to order. “I bought only as many gallons of juice as I needed to make the right amount of syrup,” she says, explaining how she would drive to the farmers’ market, load the juice into her truck, and haul it to her production kitchen in Oakland. In 2011, her third year in business, Colliau bought the juice in one 50-gallon drum so she could make a year’s supply all at once. This batch sold out a few months prior to her next production cycle, which meant her unhappy distributor had no Small Hand Foods Grenadine to sell to his eager customers for several months. Doubling her production for 2012, she watched the grenadine run out in May. She doubled production again for 2013 and the product ran out in April. In early 2014 Colliau drove to the pomegranate farm, a small family-owned operation, and struck up a deal for ten 50-gallon drums. This run sold out in August. Colliau proudly features her products, including the grenadine, at The Interval, and Vogler helps her cultivate a wider audience by featuring them on his cocktail menus at Bar Agricole and Trou Normand. 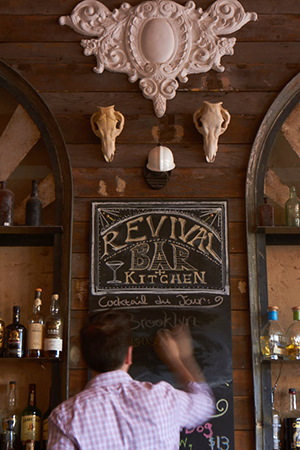 Nat Harry strains a Sin Eater into the glass at Revival Bar + Kitchen. Before refrigeration, a mixture of sugar and vinegar was a common preservative for fruit. In 17th century England, the acidulated byproduct was called “shrub,” a term that traveled to the Colonial South, where bartenders appreciated it as a mixer in cocktails and punches for its ability to deliver notes of sweet, tart, and savory flavors. The shrub has been resoundingly welcomed into the East Bay bar community with the recent arrival of Juan Garcia and Deborah Marskey, founders of Shrub & Co. The couple established their brand while they were living in Atlanta, Georgia. Returning to California to be closer to the source of many of their favorite ingredients, they found a good space for production at the Berkeley Kitchens. Refreshing the cocktail du jour board at Revival Bar + Kitchen in Berkeley. “I’ve come up with hundreds of combinations of seasonal produce for cocktails, and there are few farmers’ market ingredients I haven’t attempted to use in a drink,” says Summer-Jane Bell, an East Bay bartender who has fully embraced the garden to glass philosophy. Like most area bartenders, she counts Scott Beattie as an inspiration. Bell started out at working in dive bars in Oakland. After joining the Northern California chapter of the United States Bartender’s Guild in 2008, she began attending meetings and competitions as a way to improve her skills. While working at Hotsy Totsy in Albany, she participated in events at the Center for Urban Education and Sustainable Agriculture (CUESA), where bartenders were encouraged to use seasonal ingredients in unique ways. The CUESA experience was on Bell’s mind in 2011 when she became a partner at The New Easy, a bar on Lakeshore Avenue in Oakland. “I transformed the bar from a nightclub to a hyper-seasonal bar where every drink had house-made or seasonal ingredients,” Bell explains. “We changed the menu every solstice or equinox.” She also implemented a program called Farmers’ Market Saturdays, which involved shopping for farm-fresh produce at the Saturday Grand Lake Farmers’ Market, and incorporating the items into three drink specials to run that day only. She recently stepped down from her post at The New Easy, but not before receiving Oakland Magazine’s Best Artisanal Cocktails accolade in August of 2013. Bell continues her work with CUESA as an event organizer, and has encouraged members of the NorCal Bartender’s Guild to get involved. This year, about one quarter of the bars represented at CUESA’s events are from the East Bay, including Drexl, East Bay Spice Company, Sidebar, and Tupper & Reed. 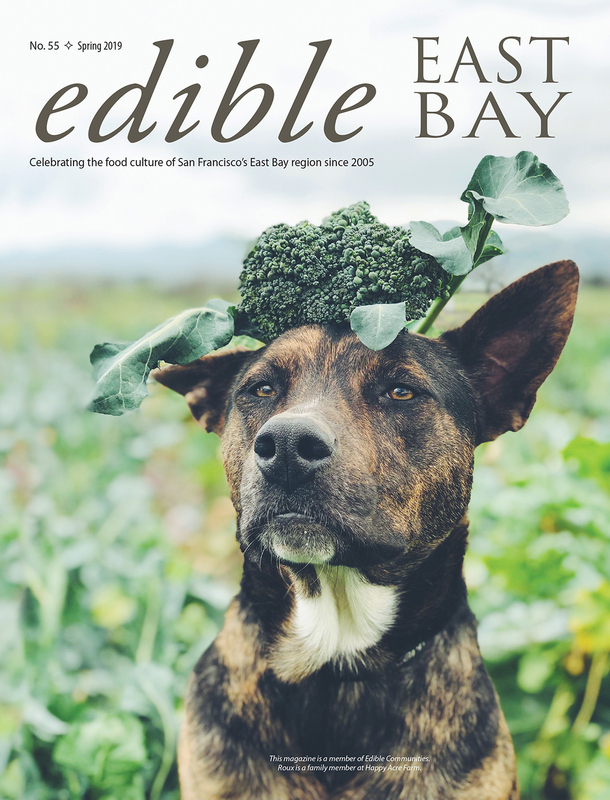 “I think this has been a huge driver to educate bartenders throughout the Bay Area about utilizing the local foodshed and showcasing what is in season,” Bell says. Nat Harry, bar manager at Revival Bar + Kitchen in Berkeley, got her start working at a neighborhood bar in Ithaca, New York, where her boss infused spirits with things like beets. This piqued her interest and served as the catalyst for her career in bartending. She moved to Berkeley in 2008, where she secured the job at Revival and found herself floored by the abundance of Bay Area resources. “Pretty much everything grows here,” says Harry, who refers to her monthly research trips to the farmers’ market as “recon missions.” Drop in at her bar this time of year and you might find yourself enticed by a Scotch cocktail that incorporates Shrub & Co’s Apple Shrub or a Blood and Sand made with juice from blood oranges purchased at the Ecology Center Farmers’ Market down the street. Like many area bartenders, Harry makes bitters, tinctures, and syrups for Revival—a trend that privileges the flavors of local ingredients and often signals a high level of quality in a bar program. It’s no surprise that the richness of agricultural diversity provides a constant inspiration to those working in Bay Area food and drink, and that the garden to glass philosophy has served as a vehicle for the cultivation of the West Coast cocktail’s identity. Fall and winter are perfect seasons to head to a cocktail bar and explore drinks that showcase local ingredients like pumpkin purée, grapefruit, and kumquats. If you request a cherry for your Manhattan or Old Fashioned, a fresh Jalapeño Margarita, or a pear eau de vie to sip, you’ll not only get to taste a bit of the Bay, but you’ll be participating in a growing national movement. Add all ingredients except the ginger beer to an empty mixing glass, fill with a full amount of ice, seal it up, shake a few times, and unseal leaving the mixture in the larger half of the shaker. Add the ginger beer to the mixture, swirl it around, and then dump it into a collins glass. Garnish with cucumber slices and bay laurel leaves and serve. Place everything, except the beer, in a shaker. Add ice and shake. Pour into a collins glass and stir in the IPA. Serve. *Wash 5 clementines well, chop into quarters or smaller, place in a blender (skins included), add 1 cup of simple syrup (2 parts sugar: 1 part water). Blend until fully puréed. Do not strain. Shake all ingredients vigorously, strain into a collins glass, and garnish with generous dusting of nutmeg. Shake ingredients and double strain into large coupe. Garnish with half a slice of apple dusted with sugar and grated cinnamon. Head to East Bay stores like Cask, Alchemy Bottle Shop, Northbrae Bottle Shop, Wine on Piedmont, or Umami Mart to find products from St. George Spirits, Small Hand Foods, and Shrub & Co.